Ecogreen takes pride in being at the forefront of the technical innovations that make LED retrofit lamps and spotlights a serious alternative to incandescent & compact fluorescent bulbs and halogen spotlights. Ecogreen engineers possess critical skills with regard to obtaining the right colours, as well as the skills to design and develop sophisticated electronics that provide Ecogreen's products with its special features. - and when LED lamps are dimmed, the colour of the light needs to become warmer to create a cosy atmosphere. The compatibility of Ecogreen's LED lamps with most common dimmer types is highly innovative as many LED bulbs are not detected by standard dimmer types. The electronics inside the lamps are ingenious and state of the art. It ensures that dimmers are always able to detect Ledzworld's lamps, and that the lamps can be dimmed smoothly (stepless) and without flickering. Ecogreen´s sophisticated built-in Temperature Control System (TCS) protects the critical electronic components in the lamp against overheating. The temperature of the electronic components inside Ecogreen's lamps is monitored continuously by sensors. When the electronic components become too hot, the lamps start dimming automatically but to such a slight extend that the user will not even notice. This enables the electronics to cool down and it prevents the critical components from overheating. The lamps will automatically return to its original intensity when the temperature inside the lamps has been reduced to the required level. This ensures that the lamps stay at least 35,000 hours in operation. This longer lifespan does not only bring large cost saving for end-users, but also results in significant CO-2 saving. A major breakthrough is that Ecogreen developed sophisticated electronics that make its LED lamps emit light that becomes warmer as the dimming proceeds. Ecogreen developed and patented a dimming feature Colour Temperature Adjusted (CTA) dimming, which regulates the lamp, not only to adjust the strength of the light output while being dimmed, but also to gradually transform from a bright soft-tone colour temperature at the highest level, to a warm flame colour at the lowest dimming level. This technology is unique as it exactly simulates the colour tones of incandescent light bulbs when these are dimmed. The specific driver of the lamps brings about an extremely high power factor which, depending on the specific model, lies between 0.85 and 0.93, higher than any other lamp on the market today. Due to this high power factor, the lamps hardly cause any reactive power (VAR), a problem that many LED applications still have. Furthermore, the lamps consume 80-90% less energy than traditional lamps and even 50% less than average electricity- saving lamps (compact fluorescent lamps, also known as CFL). Ecogreen's newest innovation is in Colour & Output Adjustment – Trimming (COAT), a new manufacturing process ensuring uniform colour and light output of its LED lamps for its professional ranges. Understanding that all lamps need to be alike as far as colour is concerned and also in terms of light output, even after dimming, Ecogreen uses narrow bin selections. And in order to become more consistent, Ecogreen does in-house subbinning. 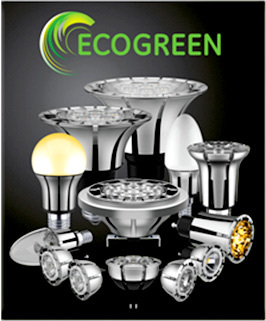 In order to serve its customers best, Ecogreen has decided to trim each LED driver before assembling the lamps. Trimming implies that every individual LED chip will be connected to its driver. Output and colour temperature are set individually for each lamp. The exact output of the individual LED chip is electronically adjusted by altering the power supply to each LED chip so that the output becomes identical and uniform despite the different characteristics of the LED. Ecogreen values the importance of the reliability of its products. The major factor that determines the lifetime of our products is heat. Junction temperature and the temperature of the drivers are the two major sources of heat inside every LED lamp. Many companies claim high lifetimes of their lamps, often only based on the data of their LED suppliers. But if these LEDs are driven at too high a current, the heat will increase and lifetime will be reduced as a result. There is a linear relationship between lifetime and heat. So controlling the LED-junction temperature is extremely important. Our junction temperature is around 90-95 degrees C.
Secondly, we have to control the temperature of all individual driver components, and use the best components in terms of temperature resistance. The TCS, Thermal Compensation System, in our lamps, will shut down the power supply to the LEDs, in order to protect the lamps when ambient factors contribute to internal lamp temperatures that are too high for the LED lamps, so that they do not last as long as we claim in our specifications. We do however strive never to reach these temperatures. During the last few months our R&D department has been working closely with component suppliers to generate a driver design that lasts as long as the LEDs. In order to remain in the safety zone we have decided to lower the temperature of our drivers by using a potting compound that was developed by a leading American chemical compound supplier. This compound will reduce the temperature of our driver by 15-20 degrees C. The material will be put inside the connector that accommodates the driver. After it dries, it becomes hard, and forms a solid substance with excellent heat-dissipating properties. The compound conducts the heat, which is generated by the individual components on the driver (PCB), directly to the outside wall of the connector. Despite the substantially lower driver temperature, the heatsink wall of the lamps will not increase that much in heat, approximately 4-5 degrees maximum. As a result the lamps will become heavier. We believe that improved reliability is more important than the lamp weight. Please find the weight of our new lamps here. The biggest challenge for manufacturers of retrofit LED lamps is the compatibility with thousands of existing combinations of dimmers and transformers. Chameleon drivers make ECOGREEN retrofit lamps truly "plug and play" devices that can be used in most of the possible combinations of the commonly used drivers and dimmers. Chameleon drivers will create lamps that are hassle free and true halogen replacements. The lamps work well on a large variety of magnetic (halogen) transformers in combination with most commonly used leading edge dimmers as well as with a large variety of electronic transformers in combination with most commonly used trailing edge dimmers. - Diamond cut surfaces disperses light into a broader spread. - Reduces glare, stray light and hotspots. - Provides better control on beam angle of the lenses.